"Father Keenan writes with compassion and with insight into the human-animal bond. Reading him, especially in regards to the need for wonder in our lives, I felt as if I were reading something of my own. This book should be of great help to those grieving over the loss of a beloved companion animal." I don't want you to stay sad. I want you to see that what feels like a very negative experience right now can make a very positive contribution to your life.... If we are patient with ourselves, if we take the time and the effort to understand our grief, we will gradually find ourselves able to grasp its power to transform us. Grieving can help us to understand our lives in a profound way, and can actually enable us to face the future more confidently and successfully. I can promise you that you will always mourn the pets you have lost, but I can also promise you that your grief can transform your life." Father Paul Keenan (1946-2008) was a priest for over 31 years, veteran radio host, author of soulful inspiration, and described himself as "Foster-parent, friend and humble slave to kitties, Dear and Princess" as well as Flicka Ann(e)/Lilla, Teddy Bear Keenan, Lionel Franklin, and Shermie before them. 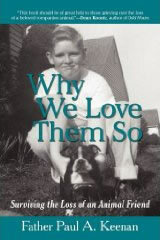 He authored eight books, including his final, Why We Love Them So: Survivng the Loss of An Animal Friend, available through Amazon.com. His books and articles will continue to inspire you, uplift you and put you in touch with your capacity to live a purposeful, meaningful life. Before his untimely death on June 10, 2008, Father Paul joined with The Perseus Foundation to head a Pets and Pals Project, matching dogs who have survived cancer with children who have cancer. His final book and this project are part of his legacy. Donations gratefully accepted to help promote his final book and launch in Washington DC his Pets and Pals Project. All proceeds from Father Paul's book go to The Perseus Foundation. With indefatigable resolve, determination, and endeavor, The Perseus Foundation, a not-for-profit 501(c)(3) works towards the cure for cancer in our animals and in humans. Through our joint collaboration with The Morris Animal Foundation, we finance research projects, enable veterinary researchers to engage in new studies, and will become a leader in the direction of a cure for cancer in our animals and in our children. The Magic Bullet Fund, a very special component of our mission, provides financial assistance to dogs with cancer. The newly established Father Paul's Thaddeus Bear Fund provides financial assistance to kitties needing care for cancer, FIP, or other illnesses. Ready to read"Why We Love Them So"? Click here.